A variety of soft fruits such as bananas, strawberries, grapes, different types of melon. Cut a variety of your child’s favourite fruits (and perhaps some they are not so keen on!) into manageable sized pieces. Offer them on a plate with the straws. Demonstrate to your toddler how to push the fruit onto the straw to make a tasty snack! This activity will support children in their fine motor development. It may also encourage them to try new textures and tastes; food is a lot more fun when you’ve made it yourself! Your toddler may enjoy dipping their finished kebab in yogurt or using a spoon to drizzle on some honey! 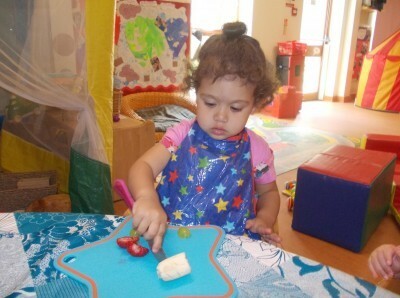 All of these activities will support in the development of their fine motor skills. If threading the fruit is a bit difficult for your toddler, encourage them to make their own fruit salad by scooping prepared fruit into their own plastic cup. You could even make a fruity fondue where you toddler can use a fork to get their fruit and then dip it into yogurt or even melted chocolate! Yummy!